PCP car finance deals let you pay for your car in monthly instalments, with flexibility at the end. Are the latest offers right for you? Whether you’re buying a new or used vehicle, car finance enables you to spread the cost over a series of monthly repayments. There are different types of finance, depending on whether you're looking for the cheapest monthly payments or long-term car ownership, as well as the ability to adjust the length of the agreement and the deposit to suit your needs. The most popular type of used car finance is Personal Contract Purchase (PCP). This comes with low monthly instalments, which only repay part of the car's cost and include interest. If you want to keep the vehicle at the end, then you’ll need to buy it for the remainder, either by paying in cash or refinancing. You’re also able to return the car with nothing more to pay because the monthly repayments are calculated to cover the value that the car loses during the agreement. This makes it easy to regularly upgrade your vehicle. There’s more information on whether PCP is the best way for you to buy a used car below (click to jump to it), or scroll down for the latest PCP deals. 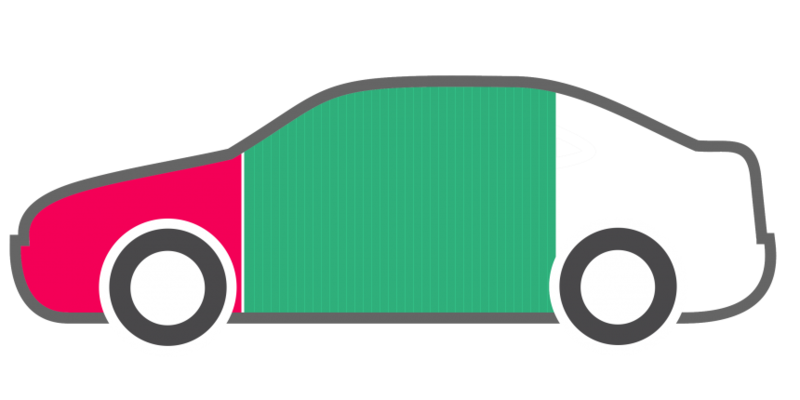 Virtually every used car under five years old is available with PCP finance, and monthly repayments start at under £100 a month, based on BuyaCar's current representative finance example, which you can see by clicking through to any car deal. The example includes interest and a ten per cent deposit, but this is adjustable: you can increase it to reduce your monthly payments. In many cases, you're also able to reduce the deposit to zero, so there's nothing to pay upfront, but the instalments will be higher. It's easy to compare PCP finance options: every quote should include the total amount payable under the agreement, which includes all interest and fees, as well as the optional final payment to own the car. An APR interest rate will also be included, showing the rate of interest and fees that are charged. There are two common types of used car finance: Hire Purchase (HP) splits the cost, minus any deposit, into equal monthly instalments, plus interest. At the end, you own the car. Personal Contract Purchase (PCP) offers lower payments, which include interest but don’t cover the full cost. At the end, you can return the car or buy it. There’s also the option of buying a used car outright in cash, or taking out a bank loan to purchase the car. So, although it's a popular option, PCP finance won't be the best choice for everybody. If you're looking to keep your car for several years, for example, then HP finance is likely to cost less overall. Assuming you can afford higher mionthly instalments, you'll repay the loan faster, reducing the interest that you pay. And if you have a large savings pot, then you could buy your car outright and avoid interest charges altogether. We've highlighted some of the pros and cons of different buying options below. ✔ Low monthly payments, makes it easy to upgrade your car and provides flexibility at the end. ✘ Restricted to cars under five years old. Can cost more than HP overall if you buy the car at the end. ✔ Fixed monthly instalments cover the full cost of the car, so you own it at the end. ✘ Monthly payments are higher than with PCP finance and it's less flexible. ✔ No interest to pay and you own the car immediately. ✘ Ties up the cash - assuming you have the savings to buy a car outright. ✔ Large choice of lenders and competitive interest rates. You’ll become the car’s owner as soon as you buy it with the loaned money.